Summary: The beast raged; it punctured the air with its spite. But the girl was fiercer. Review: I enjoyed Rin Chupeco’s first book, The Girl from the Well, and jumped at the chance to follow her into the fantasy genre. 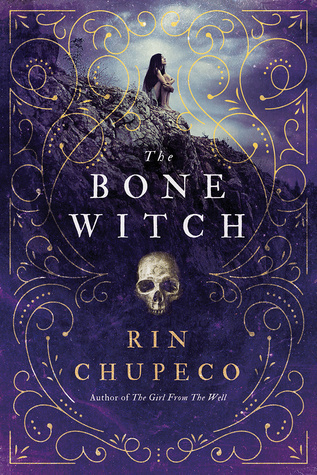 And while there were some good things about The Bone Witch (the heroine, her brother, lush descriptions, the whole idea of asha, and this specific type of magic), there were a lot of things that either weren’t or just didn’t work for me. The heroine, Tea, is an engaging narrator, and the glimpses of her in the future, having changed radically from the girl we get to know during her asha training, is intriguing. I wanted a lot more progression on this front, but that’s where the structure of the book undercut itself. Between every chapter was a very short scene of the future, between Tea and an unnamed Bard, and these scenes either constantly killed the momentum of the past or set us up for excitement that took far too long to materialize. If the interruptions had been less frequent (and had been a more coherent narrative, not mostly Tea preparing to raise or raising creature after creature after creature), this might have worked; as it was, it became an irritating distraction, especially once it became obvious that the past Tea and the future Tea weren’t going to be any closer to each other in this book, attitude/philosophy-wise, than they were at the start of it. Having the Bard narrate the future segments felt like a deliberate choice to keep information from the reader (like who Tea’s dead love is and what her plans are for all the monsters) rather than the best choice for telling the story. I felt frustrated, not teased, throughout. The thing that disappointed me most was the portrayal of the country Drycht. It’s obviously supposed to be the stereotypical conservative Muslim country analogue, what with a kingdom mostly of sand, a king with an “iron grip,” its women veiled, and its stance on gender roles. I cannot think of a single character in the book (aside from the Drycht envoy who is scandalized that Tea is wearing bold colors and must be calmed by being allowed to go on a rant about the shamelessness of women—and he is supposed to be “a progressive man in comparison [to his fellow countrymen]”!) who has anything good to say about the country or the people, aside from occasional praise of its trade goods. This negative portrayal is never pushed back against in the text, so it doesn’t appear to be a misguided attempt at having a prejudiced narrator. It is simply gross, disappointing, and makes me wonder what other red flags I may have missed in the mashup of other cultures in this fantasy world. I am interested in hearing from other readers and reviewers on this subject. Recommendation: Just skip it. While there are some good ideas here, the constant interruptions from a future stranger are terribly distracting and hinder, more than help, the main narrative, and the Islamophobic content under the guise of a fantasy culture is not redeemable. Excellent review! In addition to the Islamophobic nature of Drycht, I really disliked the fetishization of Japanese culture when it came to Kion. Some of it was exactly step-by-step, color-in-the numbers Memoirs of a Geisha, and copying a book written by a white dude is not a good way to go. I didn’t mind the interludes stylistically, but I did mind that they almost exactly followed the schema in Pat Rothfuss’ Kingkiller Chronicles. It’s like the exact same story, setup–everything. Glad to see someone else didn’t enjoy this one either–and I had such high hopes!